Comedy of Terrors. I was experimenting the the 95 Paint program again... this time with Price, Lorre, Karloff and Rathbone... Comedy of Terrors. 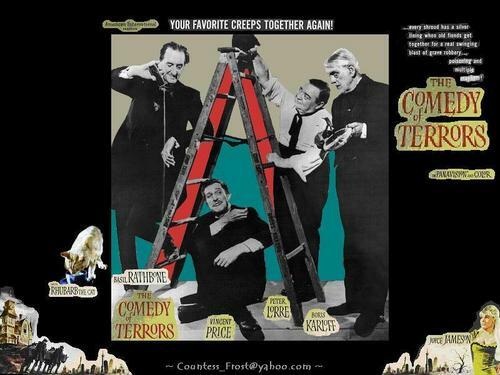 HD Wallpaper and background images in the Vincent Price club tagged: comedy of terrors price lorre karloff rathbone movie wallpaper fan art thecountess. This Vincent Price wallpaper contains anime, comic book, manga, and cartoon. Comedy of Terrors is lots of silly fun! I love that movie!